The consolidated revenues for quarter ended March 31, 2016 was Rs 419 crores as compared to Rs. 301.5 crores during the corresponding period of last year, up by 39%. Consolidated EBITDA for the quarter was Rs. 52.9 crores as against Rs 12.7 crores in the same period last year, up by 317%. The company has delivered a strong financial and operational performance in the quarter on account of successful performance of films like Bajirao Mastani, Wazir, Airlift, Neerja & Kapoor & Sons and at the Box Office. Footfalls increased by 26% to 15.3 mn in the quarter against same period last year while the Average ticket prices rose by 9% as against same period last year. Food and beverage revenues showed a stellar growth of 50% over corresponding quarter of previous year driven by increase in Average Spend per person of 18%. A 19% growth in Sponsorship revenues reflected strong continuing positive performance year on year. We see the momentum of performance continuing in FY 2016-17 on back of strong content pipeline and consumer demand. Our relentless pursuit of innovation & delivering the best movie viewing experience, growing circuit of high quality cinemas, and our company-wide emphasis on customer service excellence remain critical factors in our ability to generate positive operating results over the long-term. 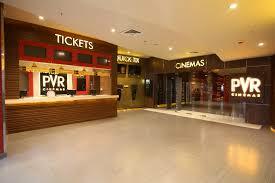 PVR is the largest and most premium film exhibition company in India. Since its inception in 1997, the brand has redefined the way entertainment is consumed in India. PVR currently operates a cinema circuit comprising of 524 screens at 114 properties in 47 cities, serving 70 million patrons annually.